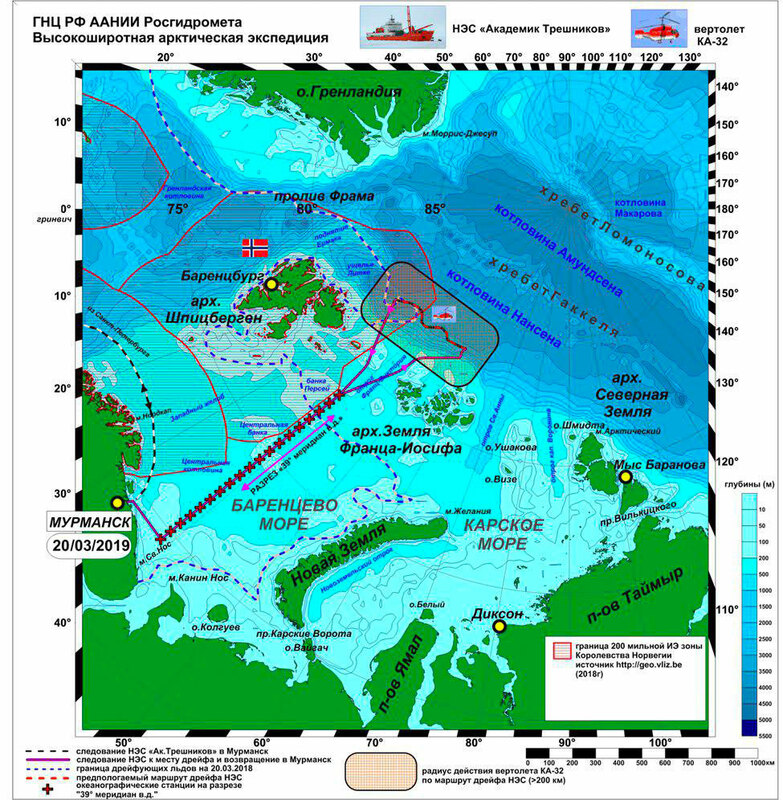 The Russian research vessel «Akademik Tryoshnikov» on 20th March set out from Murmansk with course for the North Pole. The ice-class ship will sail north of archipelago of Franz Josef Land, from where it is to drift with the ice to waters near Svalbard. On board is a major group of researchers from Russia’s state meteorological institute Roshydromet and the Arctic and Antarctic Research Institute. A key objective is to study effects of the ice on the vessel, the researchers say. Collected data will be important for the ongoing planning of Russia’s projected new Arctic research platform «North Pole», an installation that will be able to drift through the Arctic for up to three years at a time. By the 24th March, the ship had made it to the Arctic ice edge on 75 degrees North. The researchers now continue northwards to the waters north of Franz Josef Land from where the vessel will start its ice drift. The ship is expected to complete the drifting in the middle of May and then make it back to Murmansk, the project managers inform. The voyage is part of Transarktika-2019, a major government-sponsored program on Arctic research. The federal government in February this year allocated almost a billion rubles to the program that includes several expeditions in the country’s Arctic waters. 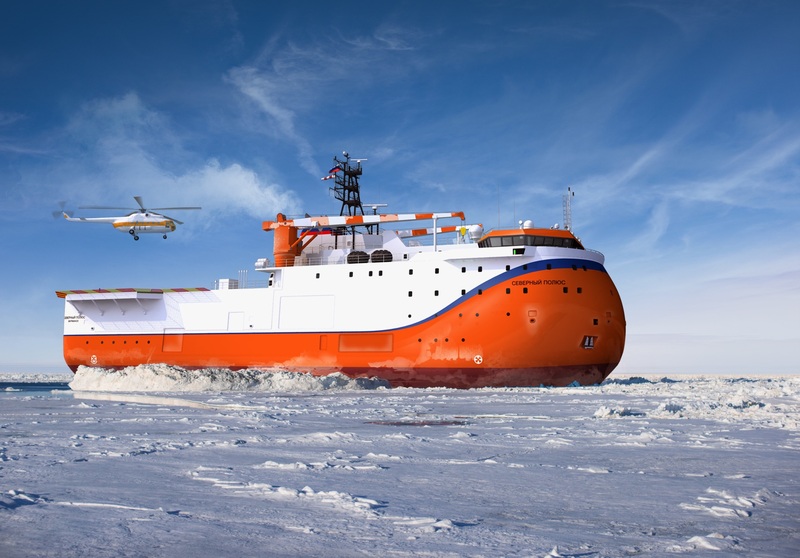 Construction of the «North Pole» platform was officially started in December 2018 at the Admiralty Yard in St.Petersburg. The 84 meter long, 22,5 meter wide installation will be the world’s first research station permanently based in high Arctic waters. It is to be completed in year 2020. The platform is to be operated by Roshydromet and is to replace the annual research stations on drifting ice floes operated by the Soviet Union and later Russia. Since 1937, a total of 40 North Pole expeditions have been made. However, the accelerating global warming and melting of Arctic ice has forced the researchers to halt the program. The last “real” ice station, “North Pole-40”, was established in October 2012, and had to be evacuated in May 2013, because the ice floe the base was placed on, started to break apart. The 16 scientists that had spent the winter on the floe had to be rescued by a nuclear-powered icebreaker sent out from Murmansk. Russia did not set up any floating stations in 2013-2014 or in 2014-2015. In April 2015 they established a station called “North Pole 2015”, that only existed for four months.